Hey All - So it may look like I've fallen off the globe but in fact I've been trotting on a fair bit of it. New work for Saveur and Feast plus work on that Turkey cookbook with a side trip to Georgia for an upcoming story. But, after freelancing for six years now I can say that it's still a thrill to see my work in print. In the fall of 2012 I had the great pleasure to travel to Italy with Saveur Senior editor Betsy Andrews where we sampled the finest in Umbria food, wine and hospitality. The article appears in the November, 2014 issue in print here and abbreviated on line here. It is always great to work with Saveur. You can see additional work from me in the India issue as well as images from Italy (above),Chengdu and Turkey for the A Day in Cooking issue. February, 2014 saw me traveling to Mexico City and Oaxaca for the October, 2014 issue of Feast. It is great to work for Feast. They give me so much flexiblity to craft the story and the Mexico piece was no exception. This was my second visit to Mexico City confirming that I might just need to spend more time there. Wonderful place. (above : Tamale stand at sunrise in Mexico City). This was my first trip back to Hong Kong in number of years. The article, written by Janice Leung Hayes takes place largely in the Western District which is famous for its' dried seafood shops. When I lived in Hong Kong in the mid 1990's Western was the end of the line, like a back water town next to the thriving Central District metropolis. That, of course, has all changed now as the expansion of the MRT has made Western the hip place to live. Still it was nice to find pockets of the city that remind of the HK back in the day. Above : One of the great pleasures of the trip were my multiple visits to Lin Heung Kui for dim sum. I could not believe how warm and welcoming people were there (these are words I thought I would never utter in regards to Hong Kong). Great dim sum in a setting that is like a throw back to the 1960's. Thanks Janice for that tip! 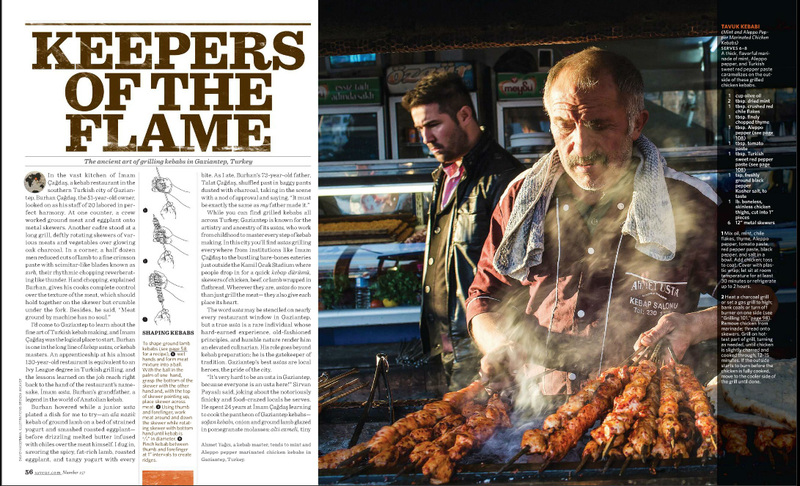 While working on our Turkey cookbook, I have been following a side obsession with eastern Turkey's wood fired ovens. Swing over to Zester Daily for a slide show to see what's happening in all things gluten. Want more? I'm on Instagram! Follow me for the latest. See ya. I love traveling and I love travel photography but there is always something nice when you can do travel photography with leaving home which is what I did for a feature on Penang street food in this month's SBS Feast Magazine. (Above : Asam laksa from two lovely sisters on Erskine Road, Tanjung Tokong, Penang). (Above : Diners wanted. Chilies to be served along side koay teow th'ng (noodle soup)). (Above : Poh Lay Koay Teow Th'ng. Conveniently located half a block from my house. Nice folks, too!). (Above : The Legend - Mdm Soon Suan Choo and her char koay teow. I went to her shop the first time I came to Penang in 2006. At that time people warned me that she was a tough character along the lines of Sienfeld's 'Soup Nazi' but I behaved myself, got served and paid the 'outrageous' sum of RM8 (about U$2.50 - most versions are about a dollar) for a plate. Today, looking back it is still a great version (I'm not one to say best..it's all subjective) and frankly she may have mellowed a bit letting me hang over her wok for 30 minutes or so to get the shot above. Something I wouldn't have imagined happening when I first visited her in 2006). (Above : My favorite vendor in Chow Rasta Market convinces a tough customer that his greens are the freshest by snapping the stem). (Above : The action goes well into the night. In Penang many vendors still use charcoal for cooking). Want more Penang? Join me this July 18-21 for a fun filled food and travel photography workshop. Still a few places left! Check here for details. See you there! We came to Hasankeyf expecting to stay one night. The city's primary draw is an ancient town set high on rock cliffs. As we drove into town we were greeted immediately by hawkers selling picture books. As we strolled into town bus loads of tourists poured into the single street heading towards the kale eager to buy a souvenier and get back on the road. But a quick right turn from the tourists and across the bridge spanning the Tigris River and we were in the middle of a herd of sheep heading home from a day of grazing in the upper hills surrounding the town. The next morning we followed the same route, connecting with a group of women heading to upper pastures to milk, by hand, a herd of some 3-400 sheep and goats. From there we were welcomed into their homes, fed handmade cheeses and freshly made ayran and watched them make bread in a tandoor oven. Four days later we are sad to be leaving. Sad too for the future of Hasankeyf and the life of its' residents. Turkey is currently constructing a dam that will flood Hasankeyf. The timing for the flooding is still a little sketchy but construction is well and truly underway. We will return to Hasankeyf, hopefully later in the year. There is so much more to this area that could not take in in such a short amount of time. One of the frustrating aspects of this job is that assignments are always too short. That certainly was the case when I was asked to shoot location stills in Tamil Nadu for Feast Magazine's April issue (sorry, print only for now). Traveling to a new place I feel like I'm just getting in the groove when it's time to pack up and head home. 8 days in Chennai, Kariakudi and Madurai just wasn't enough. Still I have plenty of visual souvenirs until that time I'm lucky enough to get a call back. (Banana dealers in Madurai's morning market. This market was the highlight of the trip (in a trip with many highlights)). (proud owner of a vintage Ambassador. Wish I could have brought one of those back). (above / below - dosa - I ate very well). (The original cubicle - a goldsmith in Chennai). (Coffee and tea stall, Karaikudi). (observing Karthigi - the Festival of Lights - Karaikudi). (Deco style building in Karaikudi). For more work for Feast click over here and here. Editors - if you like what you see, please send me back. There are a lot more pictures to be taken. We had such a great time in September, 2013 that we said 'hey, we''ve got to do this again'. And so we are. Mark your calendar for May 26-31 (Memorial Day weekend if you're coming from the states) and join us in the fun. For more details checkout our website here. Late May is a perfect time to be in Sapanca - think fresh produce in the markets, mild temperatures and great light. We will be adding additional photography instruction sessions as well as plenty of one on one instruction and review. (read what last year's participants had to say ). (Above : 'the lodge', Zeliş Çifliği, overlooking Lake Sapanca where the workshop is held). Drop me a line at dhagerman@davidhagermanphotography.com if you have any questions. We hope to see you there! (Above : A vendor gets in an aerobic workout in between customers in Hanoi's Chau Long Market). Another year passes and I'm again reminded of all the great places my camera has taken me to. Extensive travel and a workshop in Turkey, plus assigments and travel in Sri Lanka, India, Taiwan and Vietnam. A move to our newly renovated shophouse in George Town and work in my 'home town'. Everytime I push the shutter I am reminded how lucky I am to be able to do what I do. Here are a few images from the year. I hesitate to say 'best of' because frankly I am probably the worst judge of what is good or bad in my collection. What I can say about these images is that I hope that when I look back on them in a couple of years that I still remember exactly what I was feeling when I took the picture. I can't say that about every picture I take but some stick around longer than others. Let's see if these do. (Above : Sunset from the 360 Degree Bar at the Bayside Hotel, Penang, Malaysia. 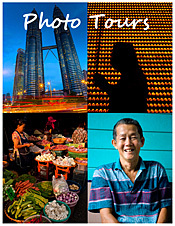 Part of a advertising campaign I shot for Penang Global Tourism. Below : A fire burns out of control on a 'super moon' night in Detroit). (Above : Taipei, Taiwan for Travel & Leisure SEA. Confession time - I love George Town but I would move to Taiwan in a second if I could. Taipei is probably the most liveable city in Asia and a great jumping off point for exploring Taiwan's deep, deep culture). (Above : Street food (char koay teow stir fried over charcoal) and a hidden shrine in George Town. Part of a personal project documenting religious shrines that dot the back alleys of George Town, Malaysia). (Above : Top - Fishing on the Bosphorus. Second - Barbunia fresh from the Black Sea). (Above : The Great Mosque of Diyarbakir on a toasty 42 degree C afternoon). (Above : The Kadikoy ferry terminal (minus the 'ballon') at sunset. I try to end every trip to Turkey with a sunset ride on an Istanbul ferry. It never gets old). (Above : Colombo's Maning Street Market. I spend a lot of time in markets but Maning market blew me away. My time in Sri Lanka was way to short. Such a colorful country and truly lovely people. Hopefully, 2014 will see this story in print). (Above : Thaipusam in Penang part of a customized photo walk. Below - Butchers at a pork shop in Chow Rasta market, George Town). (Above : top - Banana sellers in Madurai's morning market. Middle : Dressing to match your house (part 1), Rajakkad, Tamil Nadu. Above / Third - A worshipper at a temple outside Madurai, Tamil Nadu. India was such an eye opening experience. I need to find a way to get back there. Look for articles in early 2014 and more images on this blog to follow. Below : Tea shop in Mylapore, Chennai. Tea - but who knew India has such a big coffee culture? Check out my slideshow here in the Wall Street Journal Asia). So what about 2014? Well, to start with we SOLD A BOOK! So look for more travels in Turkey now through 2015 (yeah). If you are looking for something to do in April join us in Sapanca, Turkey for our second cooking, food and photography workshop. I will also be doing a similar workshop in Penang mid-2014. Watch this page for details. Beyond that - who in the heck knows? I wouldn't have it any other way. Swing on over to my Facebook page here for quick posts, tips and updates. Or follow me on Twitter @davehagerman. See ya! I'm on assignment in Tamil Nadu. Leaving the city of Madurai we stopped the car to check out a wedding celebration that was taking place at the side of the road. A small crowd was gathered opposite and I strolled over to check out what was happening. A boy was getting his hair cut for the first time to mark his first birthday. The barber uses a straight razor to shave the child's head. His hair is given as a gift to the God. The 'gift' will be given again to mark his third and seventh birthday. I suspect it will be awhile before he doesn't run from the room when he hears the words 'hair cut'. In the last few weeks Istanbul has been a transit point between Asia, the US and out east. Not a bad place to spend a day or two recovering from jet lag. People have asked me recently if they should go to Turkey given the recent protests. The answer : 'Duh?". Stay out of Taksim Square, not so much due to the protests but that is now painted over (potted plants added in Gezi! ), cleaned up and frankly boring. Follow the light and you won't go wrong.